Wedgie's wonderful world: Brrr....It's cold outside! Happy Hump Day - I do love Wednesdays....the weekend is in sight again! I'm here today with a new challenge from Christmas at Sweet Stampin......this month we'd like to see your Christmas cards featuring the theme "it's cold outside". So many possibilities with this theme! See....I told you it's a cute image! To go with my cold outside theme I picked some icy blue backing papers. My little penguins are coloured with my Promarkers and I have added a little bit of sparkle to their hats with my Promarkers. Loving the frosty blue polka dots with those adorable penguins. Such fun little penguins! Pretty shades of blue and I also love those silly hats they are wearing and the glitter just spiffs it up fine! Such a sweet card - those penguins are completely adorable! 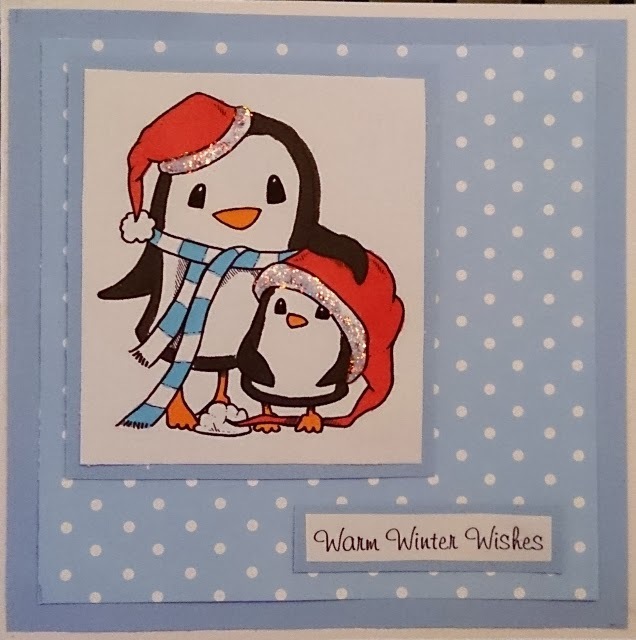 Adorable card Wedgie, I just love these two cute penguins. Beautiful dot paper. Wow - what an amazing weekend!